The reason for the high popularity of this distribution in Germany is of course the fact that the German SuSE distribution and the main branch of development is located in Nuremberg. Popularity in the U.S. is due Novell – an American company, and of course the language is English. 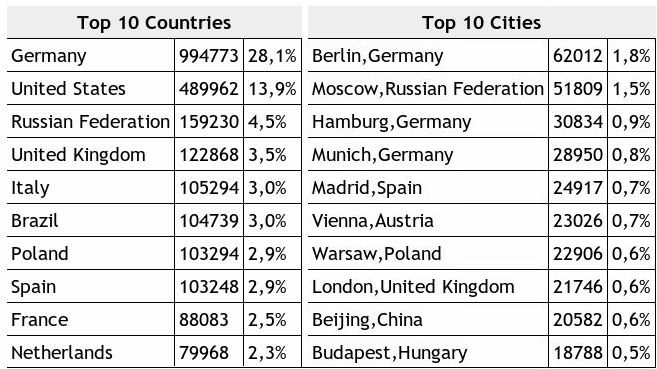 But why are so many people in Russia choosing openSUSE? Good question. One of the main things that influence the choice of distribution – the quality and localization. The global community plays a top role for quality of distribution and local make it appropriate for Russian language users (of course a local community can be as part of a global community). Perhaps most important is the documentation. And of course, not everyone wants (or can) read the documentation in English. Everyone wants to read the documentation in their native language. The distribution may be in a good shape and stable, nice and convenient, but without documentation it will use very few. Translated documentation is very important to the community. The translation must have a high quality, understandable, and as it must be kept up to date. For the community its also profitable that 2 guys from the community working for Novell (in Nuremberg and in Prague). This provides better communication between “developers – community”. It helps to be closer to the project. This allows you to always be aware of all the major news of the project. And of course the translation is much better if they are engaged not just as a translator, but the employee who works on the distribution. A successful community is a group of people who love openSUSE, who understands why the software should be free, who wants to make openSUSE better and better… every day. There was a lot of dicussion in the openSUSE project about the project wiki which was suffering from something all successful projects in some point of time experience: There is a huge amount of documentation in the Wiki, however it seems a bit unstructured, sometimes outdated or not really maintained. The brave openSUSE wiki team stepped up to change that. The decision is to set up a new wiki with a well selected set of extensions and now the content of the old wiki is going to be transfered to the new wiki. Of course there will be a rigorous quality check of the articles, as well as a new thought through structure. The goal of this huge amount of work is to provide a outstanding good and well consumable source of information for all people in and interested in the openSUSE project. That is a high goal and I admire the energy and dedication of the wiki team. The new wiki is now in place. So if you also want to help, either with the motivation of a developer telling how things work, or from the upstream perspective using the openSUSE vehicle to push the project or simply because you want to help openSUSE to become even better, first read the Transition Guidelines and subscribe on the wiki mailinglist, since most of the coordination happens there. There is also a Forum Thread going on around that. While openSUSE 11.2 gets closer and closer, all of the Boosters are mostly busy making sure RC1 and the final release are good. But we’re finding some time to work on our Boosting projects. On the umbrella site for all opensuse.org sites front, a design and user profiles are being developed . The factory.opensuse.org status site concept is being developed in collaboration with the Maintenance team, so that it will be used for seeing the state of maintenance work (ie online updates) for released openSUSE versions. We’re analysing the Build Service web client code for how to hook in there, and several team members are brushing up their Ruby skills. The reorganize contributor documentation squad are discussing a new structure on the opensuse-wiki mailing list. If you have any feedback on these ideas you can find us on the opensuse-project mailing list or on -wiki as above. If you want to help out, we’ll be using opensuse-boosters@opensuse.org in future. I talked today with Frank and he mentioned that during openSUSE Community Week some people discussed improving the openSUSE Wiki. Frank would appreciate help with the task would be very much. If you like to help, please join the IRC channel #opensuse-wiki on Freenode – it’s probably easier to coordinate via IRC than via email. We had a bit of High Performance Cluster (HPC) setup already to do distributed build using Icecream on KIWI-LTSP, now Mathis has written a “howto” use KIWI-LTSP for clustered ripping and transcoding, another kind of HPC use of LTSP network. Ready to run LTSP server is integrated in openSUSE-Edu Li-f-e DVD making it very easy to do such setups. I’m an new Packager in OpenSUSE BuildService, and i like this work. But if i would like to package for Factory, RPMLINT gives me any Errors or warnings. But these things to fix, are very difficult. Our Wiki Side for RPMLINT doesn’t contain many Error or Warningcodes. But yesterday i’ve found an Side, with other Errorcodes from RPMLINT. Today i imported these Codes to our Wikiside http://en.opensuse.org/Packaging/RpmLint. I think it is not possible to list all codes on the Side. But i wish, that the side includes more Codes in the future. No i would like to make an Call for contribution. If every Packager insert the codes, that he knows, we have an good library soon. And on this Moment i would like to make an request about helping- Thank you all for the hard Work. motivated by Aaron’s blog post More downstream fun I was thinking about how Fate could be a more important part of infrastructure in the Linux landscape. Fate is now an important part of the Novell/SUSE infrastructure and we are currently in the process to open it up for the openSUSE community. But could Fate also be useful for upstream integration? To let you participate in the discussion I think I should start with some explanations what Fate is and in which environment we are with it. Fate is a system developed at SUSE over the last few years to track features and requirements for Novell Linux products. The term “feature” is already is a topic for scientific papers, but how we understand a feature is a functionality that is not yet in the product but required or wanted. It references future products, in most cases more than one such as SLE and openSUSE. The little sketch illustrates the dilemma in which we are when it comes to product planning. Basically it is all about one thing: decision taking. 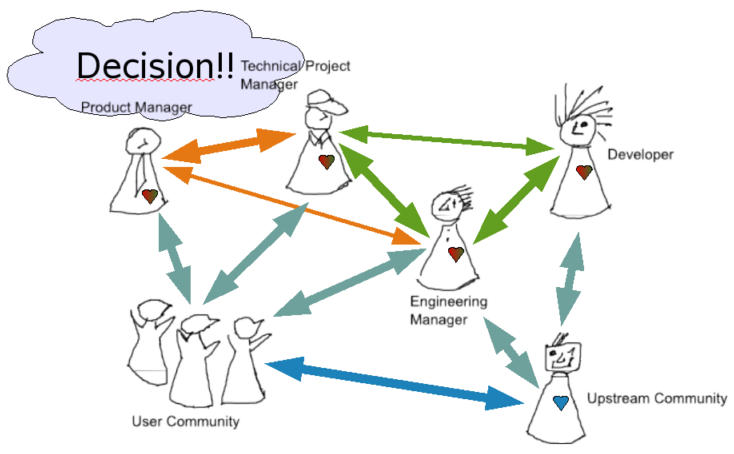 Decisions have to be taken about the new functionality that goes into a product and the tasks internal people work on. This is based on the decision how the product should look alike from a high level point of view. To make a solid decision about the high level product it needs to be clear what we are actually able to put into the product at a given time. That is only a part of what is really going on but let’s leave it with that for simplicity. 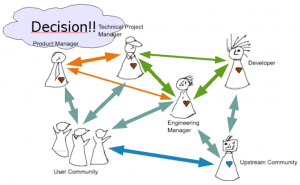 good decisions comes from different people: Product managers have a strong idea of how products should be, the technical project manager knows about dates and technical possibilities and can plan with the engineering managers how that can be achieved with the given amount of people in a given time frame. Technical feasibility is worked out with the developers as they’re the experts. The colored arrows try to visualize the communication ways, different colors mark different topics. Since we work with the communities we have more input of information: The user community tells what is needed and the upstream communities announce what they plan to do by when. The part with the internal decision taking is very much based on Fate in the Linux part of Novell and that is working fine. Features come in by a requester and all involved parts can give their thoughts in a discussion forum. The key functionalities add their priority for the feature and finally PM and TPM come to a decision. Features with a high priority have to make it into the product. Engineering managers can assign developers and they can mark features as finished. All the processes are covered by a set of configurable rules. The Fate system is integrated into other infrastructure parts. There are several clients for different needs, the most mature is the KDE fat client. What is not yet optimal are two things: There is no good way yet for the user community to community their wishes for upcoming products. We are facing that with opening up a new web based openSUSE Fate client soon. That will involve the user community not only in testing and using the product but already in its planing in a defined way. A more tricky part is how to involve the upstream communities. It would be great for a Product Manager of a Linux distribution to see the feature plans for upcoming releases of big upstream projects, maybe somehow integrated into the Fate for his product. Would the Fate model as described here in a nutshell suitable for upstream projects? For example, could KDE or GNOME make use of parts of the process for them internally and provide a structured interface to the downstream parties? If so, that could add a lot of transparency. Transparency is the precondition for flexibility and trust and as a result for better collaboration which would benefit all. 15-20 seconds long hangs that one would see when loading pages. It occured only when one was logged in, and it happened (for me) on every second access. So one page load hang, the next would work, the next would hang again, and so on. Eventually each page would load and show correctly, but after an initial waiting time of nearly 20 seconds. I experienced this on Friday, and was not happy about it, because we are preparing for an openSUSE release. I fixed it today. Fortunately, the setup allowed to narrow down the affected webserver to a single one, due to the way that the proxy distributes the requests to the backends. Now, the next step was to reproduce the hanging request on the local machine. This in order to rule out that the request might be “stuck” in the proxy, before it actually reaches Apache. However, when I did the request from locally (on the web server), it didn’t cause the hang! But a request that is passed through the iChain proxy looks different; it gets additional session state cookies. So it seems like a good idea to capture the actual request headers that Apache sees. With those headers, the problem was indeed reproducible locally on the machine. Now, it could be taken off the network (so it doesn’t get any live requests more from users), and I could start to look closer at Apache. Apache uses mod_php, which is executing PHP scripts that implement the wiki functionality, which talk to a backend database, and also talk to a memcache daemon which is used to cache user data and page results, to serve them faster. As one could easily tell with netstat, Apache was talking to both of them. To look at the timeline of these things happening, strace is useful to trace the system calls that are done. The question, though, is which Apache process to trace? Thus, PHP is waiting to read from the memcache daemon, and doesn’t get anything to read. Here, both ends will hang and wait forever. However, this was just a theory, as I was not yet sure if I read the strace 100% correctly, and don’t think on false assumption. When I coincidentally logged into the wiki, I got the hang there again – from the live server (other box). Thus, the other server(s) were clearly also affected. But worse, my test case was gone — I could no longer reproduce the issue locally. Oh well! This was unfortunate, because I was just about to capture a better strace, which captures full length, to show the complete and exact memcached communication. I used 8192 bytes of string capture length and got a trace from that. However, 8192 bytes were not enough in the interesting place, and I intended to increase it more, but that was the moment when the problem wasn’t reproducible anymore. So I switched to continue debugging on the live server, this time in a non-intrusive fashion. Still trying to find out whether the communication with mysql or memcached was at fault. Observing at the timestamps, we see a protocol desynchronization happening which makes the rest of the communication stuck (only failed gets follow). Indeed, when I did another dump with maximal snaplength (64k), it showed the “get” reading the complete VALUE, including the trailing “END” line that memache daemon appends. 0x0170:  6e74 6169 6e65 6420 4170 6163 6865 2c20  ntained.Apache,. 0x01a0:  2e0a 3c2f 703e 3c70 3e54 6f64 6179 2c20  .../p..p.Today,. 0x0220:  7475 7265 3c2f 613e 2061 6e64 203c 6120  ture./a..and..a. 0x0270:  6f72 696e 6720 6672 616d 6577 6f72 6b3c  oring.framework. 0x0340:  7465 6420 746f 2077 7269 7465 203c 6120  ted.to.write..a. 0x0390:  6865 2065 6172 6c69 6572 2064 6179 732e  he.earlier.days. 0x0510:  223b 733a 303a 2222 3b7d 0d0a            ";s:0:"";}..
Looks normal, except that the memcached reply is an empty TCP ACK, without the “STORED” confirmation. And we see the next command already being issued, which is the first in the series of those that are never replied to. This turns the command, that intends to write 1183 bytes of data, into one that indicates to memcached it’ll write 86400 bytes of data. Of course, these will never be sent, and memcached will hang forever, eating all further commands up as perceived data, and never reply in this connection. Thus, the wiki uses keys that are not suitable, while the PHP memcache implementation expects them to be valid. 0x00a0:  3936 313a 223c 703e 3c62 7220 2f3e 0a3c  961:"t;img.src="
So, I fixed the PHP memcache client to sanitize all memcache keys before usage, replacing spaces with underscores. Indeed, with the sanitized memcache keys, the problem is immediately fixed! 0x0060:  2038 3630 3121 3021 656e 2130 0d0a       .8601!0!en!0..
0x0060:  5f38 3630 3121 3021 656e 2130 0d0a       _8601!0!en!0..
A simple bug, in the end. Luckily, with a trivial fix. But quite a long way to go to find it. And I hope this writeup is useful.